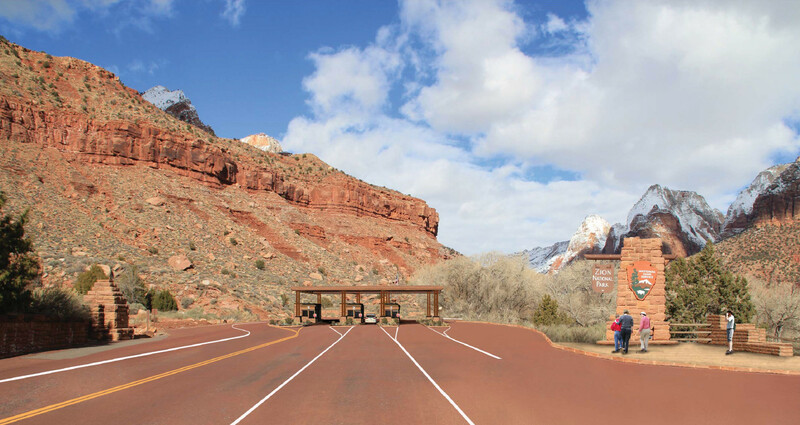 ST. GEORGE — Hoping to reduce traffic in Springdale and get visitors into the park faster, the National Park Service is working on a redesign of Zion National Park’s south entrance. Proposed plans are currently open to public comment. 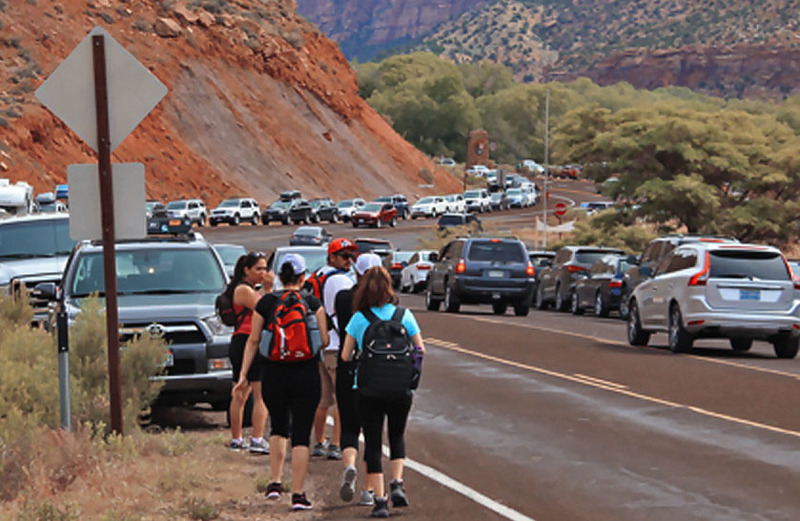 Record amounts of visitors to the park have put a strain on existing infrastructure, leading to higher wait times to enter Utah’s most popular national park. On one of the park’s busiest days of the year in 2016, the South Entrance Fee Station had a demand of 324 vehicles per hour, but the current fee station configuration only allows for approximately 194 vehicles per hour to be processed. During the busiest times of the year, wait times on weekends and holidays can be as long as an hour as cars form half-mile-long lines extending into neighboring Springdale, resulting in both visitor frustration and large amounts of vehicle exhaust, according to the park service. In response, the park is developing an environmental assessment of the proposed redesign of the South Entrance Station. In addition to reducing entrance wait times and traffic congestion, the proposal is looking to improve employee safety, develop a renewable energy source and replace faulty culverts to improve roadway conditions during weather events. Just one additional visitor entry lane would increase the number of vehicles that can be processed by 50 percent, according to a 2016 traffic analysis by the Utah Department of Transportation. This, according to the park service, would fully accommodate park entry demands. The proposed project calls for the reconstruction of the South Entrance Fee Station area by restructuring the immediate roadway to expedite traffic both entering and exiting the park. Additional fee booths, traffic islands, an extra entry lane and an employee parking area would be incorporated into the design to accommodate the number of employees required at the entrance station, while also creating areas for employees protected from moving traffic. A shade structure covering the fee booths and entry lanes would be lined with solar panels, creating enough energy to fully sustain the energy needs of the facility, according to a project proposal document. Culverts on the north and south side of the fee stations would be rebuilt to adequately capture and channel storm water runoff in order to reduce the risk of roadway hazards. The park is seeking public comment on the proposal until March 1. Comments can be submitted at the park’s planning website. Comments may also be submitted in writing to Superintendent, Zion National Park, ATTN: South Entrance Fee Station Reconfiguration EA, 1 Zion Park Blvd., State Route 9, Springdale, UT 84767.
soooo, why wasn’t this redesigned and in progress right now while the whole road is already torn up? Here we go again…the Springdale road will be finished and the entrance station will be backed up because of repairs/construction. Your govt at work. It is no wonder that many taxpayers are skeptical of the NPS’s ability to manage their resources. Record visitation has been a trend for many years, and there are enough statistics collected to determine this was bound to be a problem several years ago. In the business world, an interim solution would have been implemented, with minimal out of pocket costs to move cars through the entrance portal. This is a perfect example of a project that could be funded with the incremental entrance fees they are planning to charge at ZNP. Keep that money local, so the ZNP=specific projects get funded instead of Zinke’s private jet travel. I see the benefit of less pollution and employee safety, but in the end, it’s no more than a faster way to fill the parking lot up first thing in the morning. One thing that could speed up the process of getting in is to allow the park passes to go through without having to stop. If they need a pamphlet, then they can wait in line. It would be great to just flash the pass and get on through. We usually only want to go through the park anyway, not stop.